We talk a lot around here about the power of the small, subtle moments when it comes to wedding videos and photos, and that’s because they often tell more of the story of your big day than you may think. However, that doesn’t mean that all the major moments aren’t as telling and, as far as major moments go, there are few more major than the walk down the aisle. And while you can’t really get it wrong, per se, there is always the possibility of not getting it as right as you possibly could have. So, as longtime veterans of wedding videography in NJ who’ve seen plenty of aisle walks, we thought we’d pass on a few tips for making the most out of this especially important wedding-day moment. Consider crafting a message for guests. We live in a time when pretty much every wedding guest has the potential to turn into a photographer of sorts at any moment. It’s just the way things are in the age of the smartphone and as professional photographers, figuring out how to work around guests and/or politely asking them to move or refrain from taking pictures so that we can get ours is part of the deal. However, if you yourself don’t want all your guests holding up their phones during your walk down the aisle, then you may want to consider passing that message on somehow. You could, for instance, chat with certain guests beforehand, include something about it in your ceremony program, or make some kind of theme-inspired sign letting guests know. As far as how you should actually word it, that’s entirely up to you, but as long as you’re polite then you should be fine. Also, if you’re worried about missing out on guests using your wedding hashtag, you could always tailor the message so that it specifies that you prefer guests to refrain from taking pictures only during certain events or portions of the day, like the walk down the aisle. It’s only natural that emotions and nerves will be running high leading up to the walk down the aisle. You are, after all, just about to make perhaps the most important promise you’ll ever make in your entire life, but that’s also precisely why you need to manage your time both leading up to and on your wedding day. The last thing you want is to feel rushed just before you head down the aisle, so plan your timeline wisely and stick to it. It’s also always a good idea to include some pre-ceremony time to calm down and gather yourself before the walk. Whether that time includes your partner or not depends on your feelings toward the first look tradition. The bottom line is that there’s a big difference between the natural nerves and excitement that will accompany you on your walk down the aisle and the pure negative anxiety that will also be there if you don’t spend your time leading up to it wisely. How do you walk patiently? Well, you don’t actually, but what you can do is patiently wait to begin your walk down the aisle. Whether you’re going the traditional route in terms of who walks when or you’re doing your own thing, everyone needs to know the order, first and foremost. From there, though, there needs to be plenty of room for the bride. Think about it, you don’t want to move too fast and end up causing a portion of the bride’s walk to be blocked by another member of the wedding party or whoever else is going to be walking before the bride. 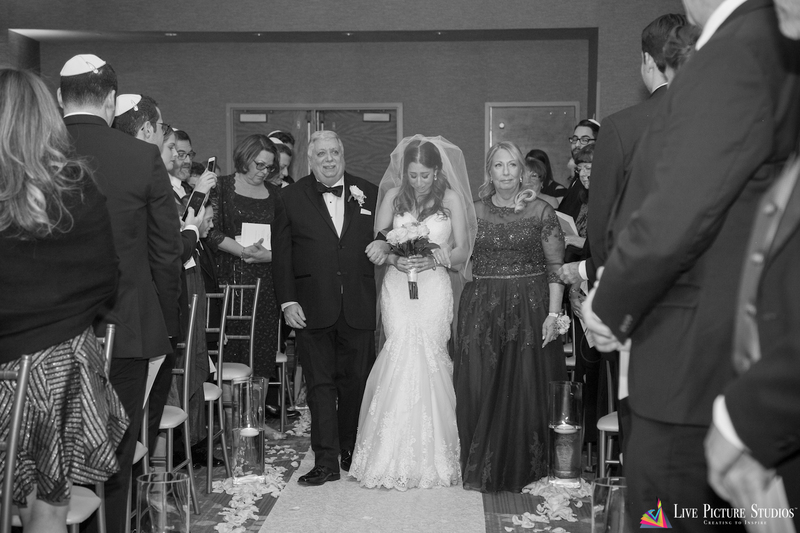 Like mentioned at the top, there are few moments more pivotal than the walk down the aisle, so you don’t want to miss a second of it. Once you’ve got the timing down, then it’s all about moving gracefully, which isn’t always as easy as it sounds. Remember, all eyes will be on you and depending on the size of your guest list, that could be a whole lot of eyes. So, just try to take your time, and a little practice beforehand in the shoes you’ll be wearing on your big day can go a long way as well. As longtime NY & NJ wedding videographers, we’ve seen our share of aisle walks. We’ve seen some truly unforgettable walks down the aisle and some, not so much, but the truth is that what separates the two is usually something entirely preventable on the part of the newlyweds. So, don’t make the same mistake. We hope these tips help, and check out this awesome post from Brides.com for some more, 5 Ways Body Language Can Give You More Confidence as You Walk Down the Aisle. About Us: Live Picture Studios has been doing wedding photography and wedding videography in NJ, NY, PA, and CT for years, and we don’t just document details, we create to inspire. Check out our photo gallery and video gallery for some examples.